Seven out of 10 inmates return after they are released from Santa Cruz County Jail. The rate of recidivism, a term for when released individuals reoffend and are reincarcerated, is often related to idleness in county jails and the difficulty of inmates reintegrating into society. To challenge recidivism and inmates’ idleness in incarceration, UC Santa Cruz alumna Sophie Hill created the Artistic Rehabilitative Therapeutic (ART) Initiative. 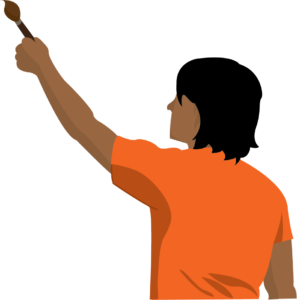 The ART Initiative is a student-run volunteer organization that facilitates art classes in Santa Cruz jails on Saturdays for groups of 6-12 inmates. The group has been going to jails to work with women’s units since 2012 and men’s units since 2015. The program started with a grant from the UCSC Student Volunteer Center and the support of the inmate programs coordinator for Santa Cruz County. Hill interviewed inmates at the main Santa Cruz facilities to identify their needs and many of them requested spaces for artistic expression. of domestic violence and incarcerated women is my strong interest in the legal system and its influence on people of particular socio-economic backgrounds,” Hill stated on the ART Initiative website. Each class is designed with a theme either pertaining to recent holidays or to a rehabilitative purpose. Student volunteers use art mediums including painting, drawing, origami and music for projects such as Mother’s Day cards and decorated masks to represent self-reflection. major depression, psychotic disorders and substance abuse. as a method for relieving unconscious feelings. She said trauma is ingrained in a person’s mind, which unconsciously triggers emotions and behaviors. Making art is a way to create a safe space for authentic expression, particularly for individuals who face challenges with traditional therapy, Amore-Broccoli said. “The goal is for people to begin to feel free and have less post-traumatic stress symptoms, i.e. depression and anxiety and eventually learn how to respond instead of react to the world,” Amore-Broccoli said in an email. Inmates are at a high risk of specific traumatic experiences such as sexual and physical assault — all within a justice system that institutionalizes and perpetuates racism. Thomas Bebbington, ART Initiative director, said the justice system in the U.S. greatly impacts specific socio-economic groups, with a large racial and ethnic overrepresentation in prisons. Black and Latinx/Chicanx individuals make up one-fourth of the U.S. population, yet they made up 58 percent of prison populations in 2008. Black people are incarcerated at the rate of 6 times that of white people and make up 1 million of the 2.3 million incarcerated population. Santa Cruz has a large houseless population and ART Initiative members said houseless people are criminalized for being houseless. These people are often readmitted into the jail system for acts such as sleeping downtown, public intoxication or drug use. In 2015, the United States Conference of Mayors’ Hunger and Homelessness Survey found that 35 percent of cities cited substance abuse as a prime cause of houselessness. “[Art class] is a time for them to be expressive, be creative, practice pro-social skills [and] learn different coping mechanisms and how to share their emotions in a safe environment,” Bebbington said. ART Initiative volunteers aim to decrease recidivism by providing space for mental expression. According to the organization, these classes aim to negate the effects of idleness by building artistic skills while inmates are incarcerated.